How to get Google Ad Exchange (Google AdX) Account? Based on the demand, you’ll get CPMs as high as $5 to $7, on a typical day. No more CPC game, it’s all about impressions now. As you’re here, we assume you know what is Google ad exchange and why one should get in. In case you don’t know, head over to this page. So, the question is how to get Google AdX account? If you’ve used any of Google’s services, you know the company prefers to allow users to get in by themselves. For instance, Google AdSense is, one of the largest, but the only, ad network available for publishers to sell their website inventories to the buyers across the globe. In order to start monetizing using AdSense, you need to sign up for the service and place an ad tag (a JS code) on your website pages. The rest is all black and you’ll be paid every 30 days. Most of the publishers aren’t satisfied with the money they make from Google AdSense. The reason is the ad revenue. Google AdX is the next step in your monetization strategy. It’s an exchange (not an ad network and there’s a lot of difference between them) which allows you to sell impressions rather than clicks. Besides, you’ll get access to a pool of new advertisers who’ve deep pockets and year-long campaigns. 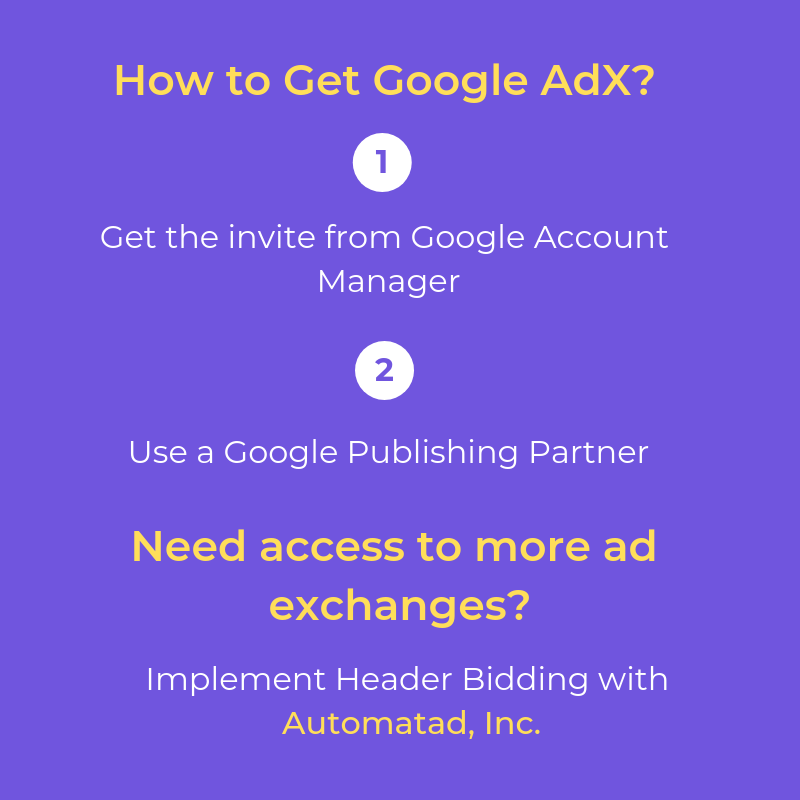 You get it, now here’s how to get Google AdX. Yeah, the simplest way to get into the Ad Exchange run by Google is to ask Google itself. Usually, you’ll be assigned a Google Account Manager* and you can just ask him/her to know whether you can get into the Google AdX. *Google Account Manager will be assigned to every publisher who uses Google’s ad server – Google Ad Manager (formerly, Google DoubleClick). Most likely, the account manager will push you to Google AdX if you’re eligible. So, what if you’re not eligible? But first, what I need to have to become eligible? We have to say something. Google doesn’t publicly list the minimum requirements you need to get access to its exchange. But 5 million page views per month is the number that’s been thrown around a lot, as the minimum requirement for a publisher. – Having non-brand safe content. – Altering site behavior (initiating downloads, redirect to unwanted websites, etc.) without users’ consent. – Failing to host an ads.txt file. You can partner with a third-party of your choice to get into Google Ad Exchange. 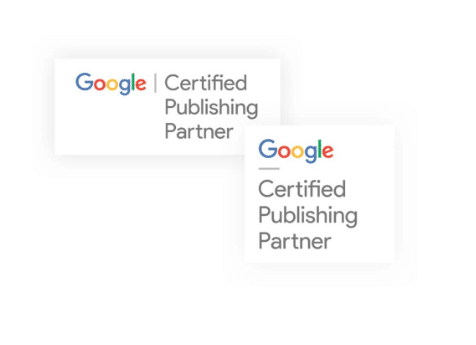 Google runs a program dubbed “Google Publishing Partner” where third-parties write exams to get vetted by Google and end up with a badge. There are many publishing partners in the market. They’ll resell you the Google AdX even when you aren’t getting the invitation from Google. There’s a catch. You have to pay them for access. Most partner will take 20 percent of the ad revenue generated every month. It’s a good option as you’re getting the exchange access, but you still end up paying more than you should. First, Google will take some cut as they are running the exchange. Next, a publishing partner who allows you to sell your inventory on Google ad exchange will take a 20-percent cut. So-called “Ad tech tax” will eat your revenue. That being said, there’s a probability for you to make more even after the tax. It depends on several factors, including but not limited to traffic, audience geography, and niche. Header Bidding. By now, you should’ve heard about header bidding. If not, it’s time. Header bidding is an advanced programmatic technique which gives you access to several ad exchanges like Google. One of the advantages of header bidding is that you’ll be able to conduct auctions without any bias and the highest bidder will win the auction, thus, earning the best possible CPM (or ad revenue). Sign up for this short email series to know all about header bidding. We offer header bidding for both mid-sized and premium publishers across the globe. What’s more? We’re authorized by Google to resell Google AdX demand, through Google Scaled Partner Management (SPM) program. This means we can get you access to Google Ad Exchange along with other ad exchanges. At the end of the day, you have all the major exchanges competing proactively for your inventory. Based on the demand, you’ll get CPMs as high as $5 to $7, on a typical day. No more CPC, it’s all about impressions now. Weekly Roundup: Header Bidding Vs Google’s Unified Auction, Adtech Tax, and More.